It’s fascinating to me how many reviews of the Shakespeare Theatre’s current production of Cymbeline starts off by talking about how difficult the play is to produce, to understand, to perform. It’s as if every one feels they have to make apologies for the fact that this is not a production that works. Maybe they are confused by the fact that director Rebecca Bayla Taichman’s last two outings, Twelfth Night and Taming of the Shrew, have come off rather well, whereas here the play just gets lost, seemingly out of her reach and out of her control. Sure the plot of Cymbeline is a little convoluted (just try and explain it in 30 seconds or less – you can’t), and the joke is that you just take all of Shakespeare’s other plays and put them together. It’s wacky, yes, but that’s part of the charm, charm that is sadly lacking in this production. In the midst of all this “fixing” Taichman has forgotten to, well, direct the actors. The performers demonstrate an embarrassingly low skill level. Actors are not physically present and they run out of breathe at the end of lines. They replace emotion with vocal tremor. Pisanio (William Youmans) spends the whole play with his hands clasped in front of his crotch, which I’m pretty sure is one of the first things actors learn not to do, right after they are told to “project” and “cheat front”. 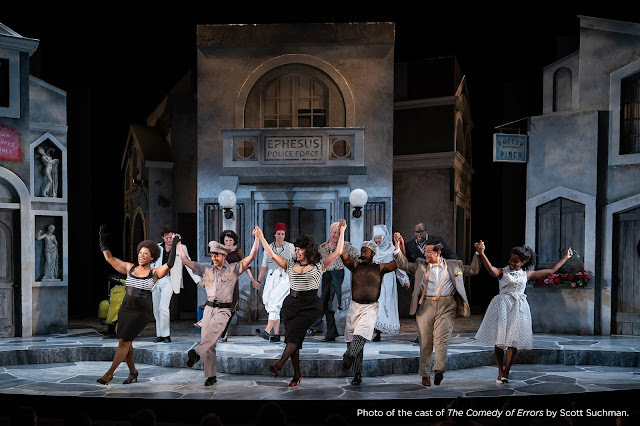 Even the usually excellent Ted van Griethuysen and Franchelle Stewart Dorn as King Cymbeline and the Queen make little impression, simply wandering around stage swamped by their massive costumes. The acting was so disappointing that I don’t really want to talk about it in more specifics. Instead I want to address what I think Taichman was trying to do with the play, even if she failed. Cymbeline is not a walk in the park to direct. There are a few countries to travel through, a war to fight, lost sons to rediscover, bets to win, disguises to don, and revelations to be, well, revealed. It has a plot stuffed to the brim, one that just so happens to start with an impossible scene. The way Shakespeare writes it, two old guys walk out on stage and start talking about what’s happening in the world. Hello exposition! These guys introduce us to the characters, the plot, and the tiny details that we will forget before they become important again. Secondly, in the middle of the fifth act Jupiter DESCENDS FROM THE SKY. When’s the last time you saw a play with a literal deus ex machina? The final scene of the play is quite prolonged with reveal after reveal after reveal. These three elements are challenges, but I hate when directors treat them like they are problems. There is a difference between a challenge and a problem. A challenge needs to be met; a problem needs to be fixed. Taichman’s solution to these challenges is most certainly not to meet them, but to run and hide from them as best she can. She adds a frame to the story, that of a Storyteller (Dee Pelletier) telling the fairy tale of Cymbeline to a little Girl (Zoe Wynn Briscoe). The two perform the pared down opening scene with the Girl in a white bed, ready for the night, and the Storyteller holding a massive tome. It’s a device that isn’t fully thought out. Are these two part of the story, or separate from it? Does the Storyteller have power over the outcome? She steps into the tale to give Imogen her ring, and she also takes on the part of the doctor, but these two elements are not enough to create a narrator with influence. Sometimes it seems like she does have influence, and at other moments she seems to have been forgotten. Shakespeare’s texts are full of direct audience address, something that’s always a little awkward in a lights-off, proscenium theatre, so I wonder if they ever considered having characters speak to their built in stage audience of the Girl and the Storyteller. The Girl sits on her bed, watching the story unfold. But she seems to conveniently disappear during the more adult portions of the play, like when Iachimo practically molests Imogen. Is this part too much for the Girl? Did the actress get fidgety in rehearsals and need to leave the stage? What this devise fully considered before it was implemented? There was one single moment in the play that was interesting to me. I don’t think the idea was pulled off, but at least I saw something happening. Near the end of the play Posthumus is thrown in prison, gives up hope, wishes for death, and falls asleep. The ghosts of his family appear and berate Jupiter for making Posthumus’s life so rough. Jupiter “descends in thunder and lightening” and basically says that all will be well. In Taichman’s version there is only one ghost, portrayed by the Storyteller. And there is no Jupiter. Instead the Girl stands up, holding the massive tome, and reads the lines of Jupiter. There is thunder and lightening. It begins to rain. The soldiers, who have been lying onstage, dead from fighting, stand up. They hold out their hands, catch water, and pour it over their heads in a sort of baptism, rinsing away blood and death. The Girl and the Storyteller walk around the stage, picking up a few of the swords. The soldiers follow suit, picking up the swords and leaving the stage. Iachimo is the last and he turns and looks at the Girl and the Storyteller before exiting, moved by whatever has just happened. One of the difficulties directors seem to have with Cymbeline is the fact that it isn’t easily categorized. (Why do we need these categories, I’ve never understood, but that’s another post.) In the first folio, it’s placed with the tragedies. But it’s also an English history play, and the happy ending cause many to consider it a comedy. Later critics have titled it a romance, or a problem play (a term I hate, as you may have noticed). The staging of this scene suggests that up unto this point, Taichman sees the play as a tragedy. The Girl and the Storyteller step in to prevent the terrible ending this play is rolling towards. They bring about redemption, for the soldiers, for Iachimo, for all the characters. Right after this scene comes the speedy conclusion of the play. All can end well because the Girl has essentially refused to accept of tragic ending, and she has prevented it. It’s a fascinating idea, but -- if the idea is that tragedy has been subverted and turned to comedy, then why is the bank of water running across the back of the stage left red and bloody? It’s the lack of attention to details like these that make this concept completely fall apart. It’s an idea that I wish was more fully and more intelligently explored in this production.